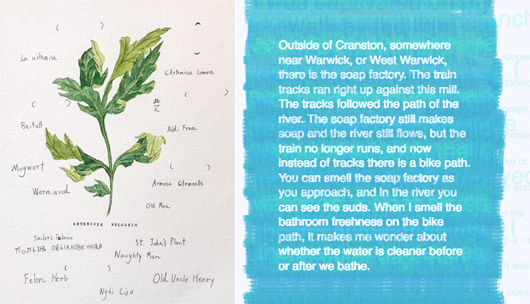 This exhibition catalogues the process of the students’ work with artist/faculty Mary Mattingly to create a public art project for Hartford inspired by the Park River. The Park River’s North Branch runs through campus before being engineered to run beneath Downtown Hartford. 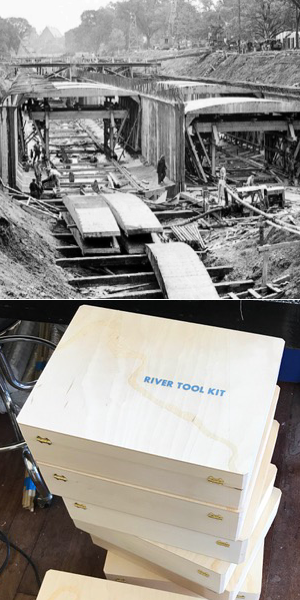 This river has served as inspiration for an ongoing blog, individual artworks, activities based on co-education and learning, and a Fluxus-inspired toolkit that encourages a deeper engagement with rivers. Nomad/9 MFA: Interdisciplinary, is a low-residency program at Hartford Art School, focusing on sustainable culture and cross-disciplinary art practices. These events and artworks have been created by graduating students Rachel Dennis, Kay Douglas, Megan Driving Hawk, Désirée Duell, Susan Hackett, Benjamin Hao, Andrew Oesch, Jess Porzuczek, Rory Sparks and Tathy Yazigi. Real Art Ways has a longstanding relationship with the Hartford Art School going back to RAW’s founding in 1975. One of Real Art Ways’ missions is to provide opportunities and exposure for emerging artists.